Staff will communicate to Persons with disabilities in ways that take into account their disability. We will train service staff on how to interact and communicate with our diverse user community and persons with various types of disabilities. RULA is committed to providing fully accessible telephone service to all customers. We will train staff to communicate with library users over the telephone in plain language and to speak clearly. We will offer to communicate with users via email if telephone communication is not suitable to their communication needs, or is not available. RULA is committed to serving persons with diverse disabilities who use assistive devices to obtain, use or benefit from our collections and services. We will ensure that our employees are trained in the use of the various assistive devices that may be used by users with disabilities while accessing materials or services. We are also committed to our Adaptive Technology Lab on the Library’s third floor through our partnership with the Access Centre and Computing and Communication Services. RULA is committed to providing accessible library notices or invoices to all our customers. For this reason, library notices or invoices will be provided in accessible formats upon request. The library provides accessible formats to student, faculty and staff with print disabilities. Accessible format texts are coordinated by the Accessibility Services Librarian. For more information about accessible format texts please visit our page Services for Persons with Disabilities. RULA provides assistance with the retrieval and/or photocopying of library material as well as research assistance. Longer loans for our materials are also available for users with print disabilities. Please contact Kelly Dermody, Accessibility Services Librarian. Kelly Dermody, Accessibility Services Librarian. When delivering instructional sessions, Librarians will take into account the diverse needs of persons with disabilities. RULA welcomes persons with disabilities who are accompanied by a service animal to areas to which the public has access, and the animal is not otherwise excluded by law. While visiting the library, it is the responsibility of the person with a service animal to control the animal at all times. We will ensure that staff are trained in how to interact with persons with disabilities who are accompanied by a service animal. In the event a staff member or patron is allergic to animals, alternative arrangements will be negotiated. Persons with a disability may enter the Library accompanied by a support person and will have access to that support person at all times. RULA may require a person with a disability to be accompanied by a support person while in the Library, in situations where it is necessary to protect the health and safety of the person with a disability, or the health and safety of others on the library premises. RULA will make reasonable effort to provide customers with notice in the event of a disruption in the facilities or services usually used by persons with disabilities. This notice will include information about the reason for the disruption, its anticipated duration, and a description of alternative facilities or services, if available. In order to make information accessible the signs and printed notices will be clearly laid out, of sufficient size and easily readable. The signs and printed notices will be displayed prominently in the library. RULA will ensure that all staff and volunteers to whom this policy applies receive training as required by the Accessibility Standards for Customer Service. In addition, training will be provided to RULA employees as part of orientation training for new employees, and on a continuing basis as required. The amount and format of training will depend on the level of the employee’s interaction with library users and position in the University A record of training received by library staff will be kept by Ryerson University’s Human Resource Department. 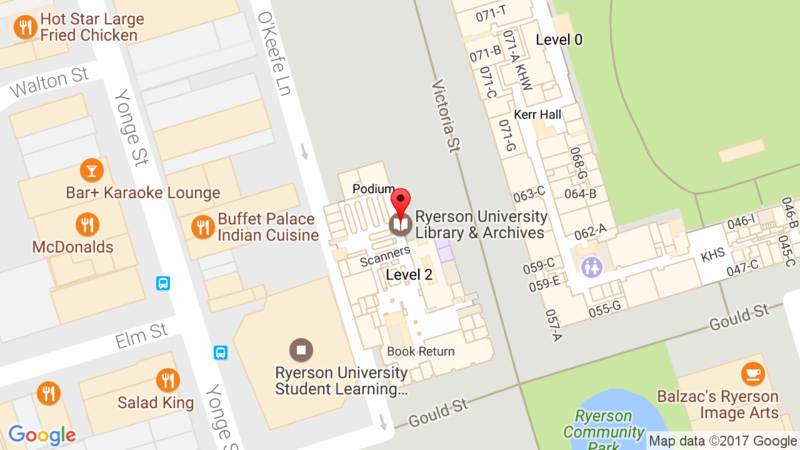 How to use the equipment or devices available through Ryerson University that may help with the provision of Library services to persons with disabilities. RULA welcomes feedback, including feedback about the delivery of library services to persons with disabilities. Users can submit feedback to Kelly Dermody (phone: 979-5000 x3093 or email: kdermody@ryerson.ca). Alternatively, users can submit feedback through the Library’s On-line Suggestion Box. RULA is committed to developing customer service policies that respect and promote the dignity and independence of persons with disabilities. Therefore, no change will be made to this policy before considering the impact on persons with disabilities. Any policy of RULA that does not respect and promote the dignity and independence of persons with disabilities will be modified or removed. We consult regularly with the Access Centre for Students with Disabilities to provide, review and where possible improve our facilities or services for persons with disabilities.